The other weekend I wanted Sangria in a bad way and looking around my kitchen I was able to come up with what seemed like a good combination of ingredients to make it. Rather than look up a recipe I just threw together a combination of things that sounded good at the time. - 1 peach " "
I put the mixture in a carafe covered it and let it sit in the fridge for the remainder of the day. That night I poured myself a glass and it was really good! I enjoyed it over the rest of the weekend and it was even better the next afternoon. Eating the fruit was the best part. 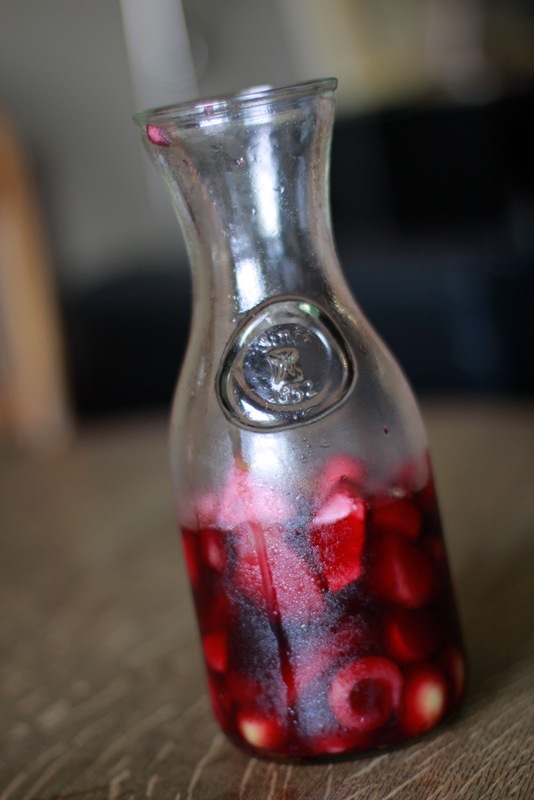 Before doing this post I did a little hunting around online for sangria recipes to compare and found that they vary pretty greatly but what I concocted last weekend isn't very close to anything I found. Most of the recipes had brandy, sugar and ginger ale or club soda added. I'll have to play around with my recipe but I think I liked it with just the agave and fruit sweetness. I will definitely try throwing the soda into my glass after pouring my drink next time though.